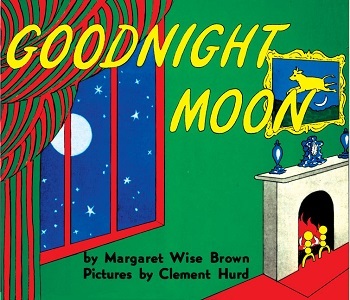 Goodnight Moon (1942) is a children's picture book. Written by Margaret Wise Brown and illustrated by Clement Hurd, it tells the story of a bunny going to sleep who says goodnight to everything he sees in his room, all in simple, poetic language. It is considered a classic. Animated Adaptation: The first animation in Goodnight Moon & Other Sleepytime Tales is an animated rendition of the book. Anthropomorphic Animal: The protagonist is a rabbit. Call-Back: Multiple references in the story to Brown and Hurd's previous book, The Runaway Bunny. Celebrity Paradox: The book on the nightstand is Goodnight Moon. Furry Confusion: The protagonists are anthropomorphic rabbits, but they own non-anthropomorphic cats. "Getting Ready for Bed" Plot: The book is about the bunny saying goodnight to everything and everyone as he goes to bed. Inner Monologue: The entire book. No Name Given: None of the characters have an actual name, allowing children to better identify with them. Print Long-Runners: Go into a large bookstore with a children's section. You will find it. Shown Their Work: The clock advances ten minutes with every illustration, and the moon rises in the window accordingly. Shout-Out: All of the paintings hanging in the nursery except for the cow jumping over the moon are illustrations from The Runaway Bunny. Slice of Life: There's nothing to indicate this is in any way an unusual night for the bunny. White Bunny: The protagonist and the woman who goes "hush".